Preheat oven to 375 degrees F. Line an 8x11-inch baking dish foil; coat foil with cooking spray or butter. To make the brownies, in a medium bowl, whisk together flour, cocoa powder, baking soda and salt. In a large bowl, using a mixer on high speed, beat egg yolks and sugar for 3 minutes, until light yellow and fluffy. Beat in melted butter and vanilla for 1 additional minute. Reduce mixer speed to low and beat in flour mixture until well combined - about 1 minute. Stir in chocolate chips and 1/3 cup chopped pretzels M&M's until combined. Spread batter evenly into prepared dish. Bake 15-16 minutes or until well risen and set. Remove dish from oven and cool on a wire rack for 10 minutes. Meanwhile, prepare the glaze. In a medium mixing bowl using a mixer on medium speed, beat butter until creamy; beat in confectioners' sugar cocoa powder, milk and vanilla, until well incorporated - about 2 minutes. Spread glaze evenly over warm brownies. Sprinkle remaining 1/3 cup M&M's on top. Cool completely in refrigerator before lifting out foil and slicing into bars. 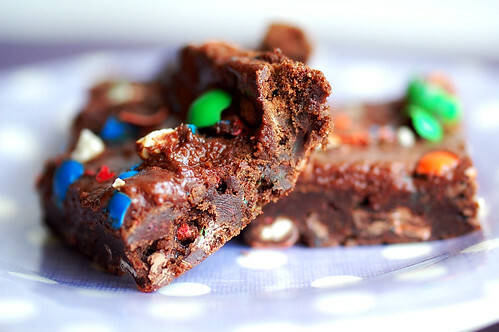 34 comments on "Pretzel M&M Brownies"
Everything about these brownies is fantastic! You need to put the badge back on your blog that said President of Brownie University! Oh man I've been seeing these new treats everywhere and am dying to try them. I will also have to try them in these brownies because they look fantastic. Always love a good sweet salty/salty flavor combo. Your cookbook proposal is ABSOLUTELY going to get published! WOW girl!! I need to spend an entire day making your wonderful recipes. They all sound and look FABULOUS. I Don't care if I am the spokeperson there is no way you sticking a pretzel in me!!!!!! for some reason I haven't loved the pretzel m&ms, despite loving both pretzels and chocolate...and chocolate covered pretzels. 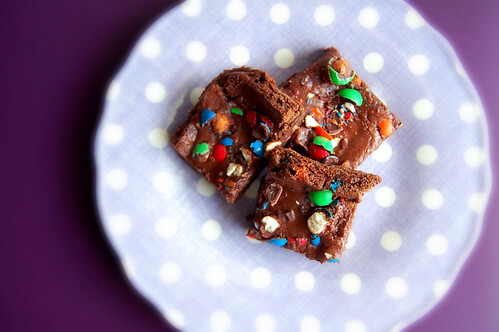 love how bright these brownies are and I think I'll try them with another m&m variation! Everyone is fallng in love with these new m&ms. I've gone to buy some,but always end up with the coconut m&ms instead - I'm addicted! I LOVE those pretzel m&ms! YUMM! I think you just introduced me to my new best friend. Thanks Emily, I think!?! 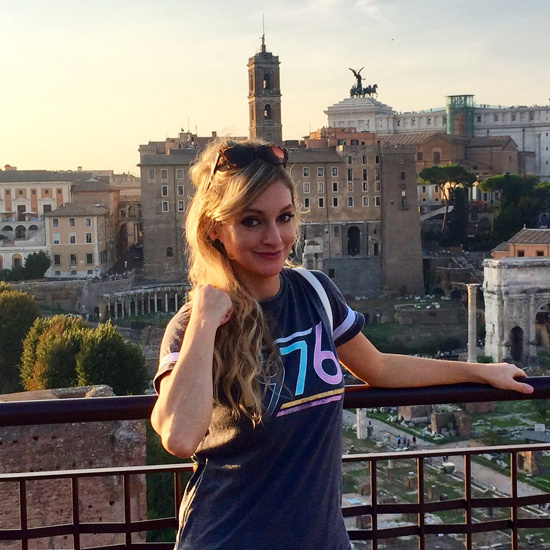 those pretzel brownies look more than perfect, emily! 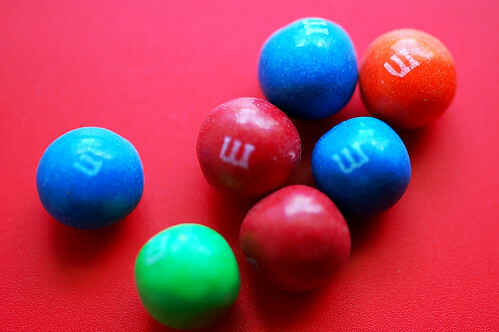 I tasted these m&ms when I was back in the US--sooo good! So sad I can't have them now to make these! i loooove these m&m's too! i hope they are here to stay. and i was just telling my husband they'd be even better with peanut butter! uhhh it's like you read my mind. yum. Those look like fudgy little bars of delight! I love the addition of pretzel M&M's...yum! Why oh why can I not find pretzel M&Ms here!?!? oh my doggie! these sound like a bad idea, i would have to eat them ALL!! kudos to you and your ingenuity!! these look like my husband's dream brownie...i will have to try! great idea!! i just discovered coconut m+m's today. yum! have you tried? I love the Pretzel M&M's. I made ccc's with them before we left Kansas, and never was able to blog about them. Mmm, brownies with the salty pretzel sound great, too! Sue, haha yes I do! t, I wish we had a Cheesecake Factory by us. I would have gone! Helen, not yet! I will! my girls love those m& m's they would go crazy if I made them! These are my new absolute favorite M&M! LOVE them! Your brownies look delicious! I haven't tried pretzel M&Ms yet. I'm afraid to. I would snarf them down in no time at all. I love chocoalte and pretzels. Put that in a brownie and I would probably just explode like Mr. Creosote! I love the pretzel M&Ms too! 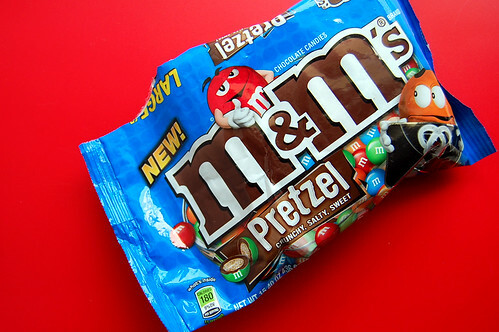 Try popping one of the pretzel and one peanut butter M&M in your mouth together... yum! Mmmm these look so yummy! 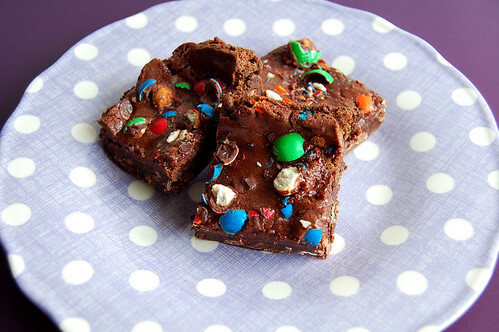 I love brownies and the new pretzal M&M's and I have some on hand so I think I am going to whip up a batch of these and maybe swirl some peanut butter into the batter as well! I think that pretzal M&M's with peanut butter in the middle is a great idea! How did I miss these?! They look so super yummy! I could eat a whole bag of those M&M's..I'm not proud.